Goodbye Bleriot. Hello Long Haul Trucker. The news has been the lists for a few days, and now Grant Peterson of Rivendell Bicycles has confirmed his plan to discontinue the Bleriot 650b frameset. As you know, faithful readers, I had an excellent ride at PBP last year on my coupled and repainted Bleriot. It felt light, handled well, the wheels rolled wonderfully with 32mm Grand Bois tires, and I was comfortable the entire way. Grant explained his decision on the Rivendell Owners Bunch list. 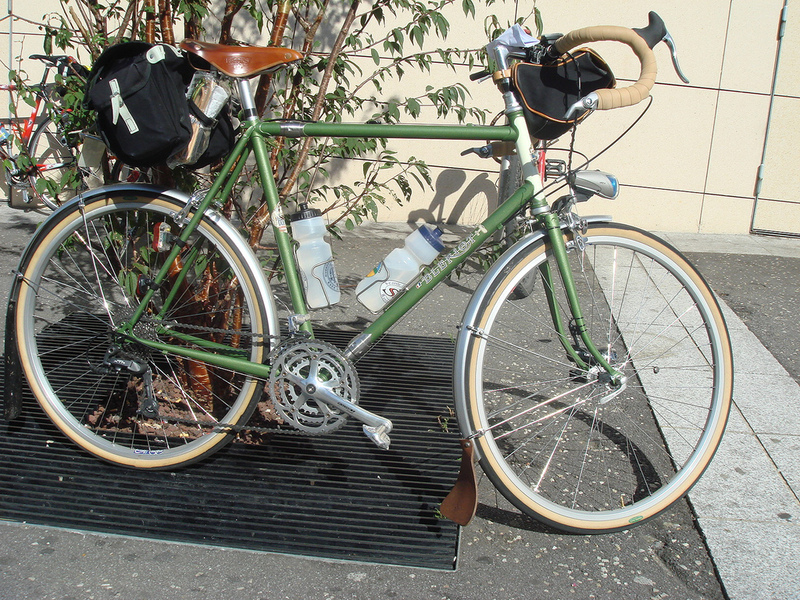 The Bleriot deal was too good to last long: a Rivendell production frameset, lugged, at an MSRP of $750. The problem was that internet dealers were selling them for less. That was the downside of marketing the bike through wholesaler Quality Bicycle Products, which made them available to any shop with a QBP account. I bought mine for less than MSRP so I probably contributed in my own small way to its demise. Grant says Riv will continue to have some frames in stock for awhile. Interestingly, of the traffic on TDR, the My PBP Bleriot post is the top viewed page, followed by my Kogswell P/R page. In with the new: MG went ahead and bought the 54cm Surly Long Haul Trucker she was checking out on Sunday. It is a great deal though it has one tiny flaw, which I’ll discuss in a minute. 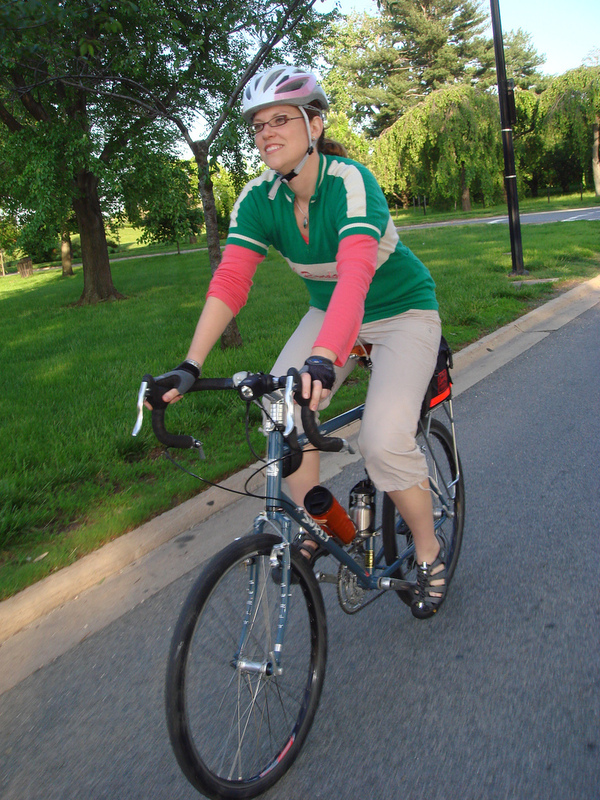 She loves it so much more than her Novara Randonnee for commuting and riding around town. It’s a pretty sweet build with lots of silver: Shimano XT hubs and rear derailler, Shimano Tiagra front derailleur, Shimano 9-speed bar ends and 11-34 cogset, Sugino crankset with touring-friendly 110/74 b.c.d. 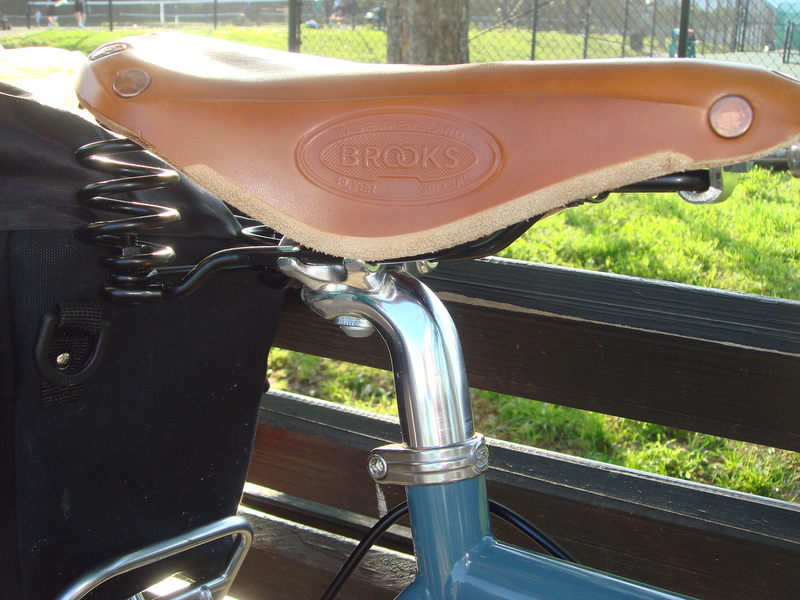 pattern rings, and normal non-ergo handlebars. I did the math and I couldn’t part it up for any less than the $980 list price. I would switch out the Tektro Oryx brakes but that’s more an aesthetic thing. They work fine so far. Prospective buyers should note that the 54cm size runs a size large; MG normally rides a 56cm or 57cm in Rivendell sizing, and found the 54cm LHT fits perfectly. The only flaw we’ve found is that the seat tube, which is supposed to be 27.2mm, is a little oversized. The post kept slipping down. The shop tried a 27.4 today and it fit. MG is going to live with it for now. UPDATE: MG corresponded with Surly as did her shop, City Bikes in D.C. about the seat tube, and Surly is sending a replacement frame. Well done, Surly. 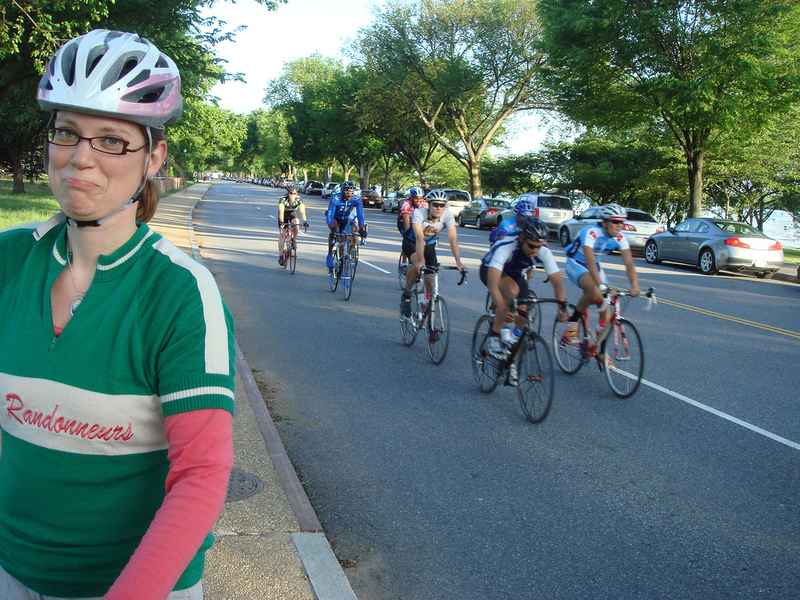 We had to pull over to try to adjust it on the bike’s maiden voyage Tuesday, amidst all the racers flying up and down West Potomac Park because Hains Point was flooded at its southern end. Ok, you’re probably saying, “what’s up with all the bikes?” MG really likes the whole LHT vibe and felt she should grab it before Surly drops it or raises the price due to the tanking dollar. She’s going to sell the Novara to keep the stable in check. Even though it’s not lugged, the LHT is a pretty cool bike and a great deal. If I had to recommend an affordable do-all bike for commuting, touring and brevets, it would be the LHT. I don’t think any sane bicycle rider would ask “what’s with all the bikes?” Would they? I hope you will reply to this as this is a fairly old blog message. I am also interested in purchasing a 54cm Long Haul Trucker. However there are two frankenstein things I want to do with it. First, I want to make it a fixed gear utilizing an Eno hub. Next, I want to know if it’s possible to do a 650B with this frame? If so, which brakes will work the best? Sorry, can’t help. I think some folks have converted from 26″ to 650b with Paul Moto-lite brakes. I ride a 54cm LHT nice fit. Are you still riding a Bleriot? I’m building one up right now and would be quite interested to hear your latest thoughts/observations on this bikeI know it’s been a long time since you posted. Are you as impressed (overall) by the Bleriot as you were before? I still enjoy this bike very much. It is one of Rivendell’s unheralded gems. None of my past observations have changed — if anything, I appreciate this bike more as time goes on and market prices for similar quality framesets continue to climb.